If you haven't been watching two fish play Street Fighter 2 on Twitch, then frankly we'd like to know what it feels like to have a life. Please, let us know. 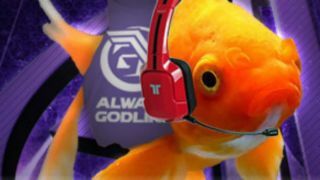 But if you've been as glued to the action as we have, you might have noticed that Aquarius the goldfish is now officially sponsored - complete with tshirt and headphones. Somehow he's reeled in a nice little deal with Always Godlike, making him the first every pro gamer fish. That's right, he's beaten you to it. How does that feel? Now a campaign is underway to get Robert the Bruce a sponsorship deal too. We might step in ourselves if salmon else doesn't beat us to it. Head over to Twitch for a front-seat on the action. You can also check out an exclusive Reddit AMA with Robert the Bruce, or head over here to see some "paparazzi" shots of Robert from earlier today. They're not to be missed.